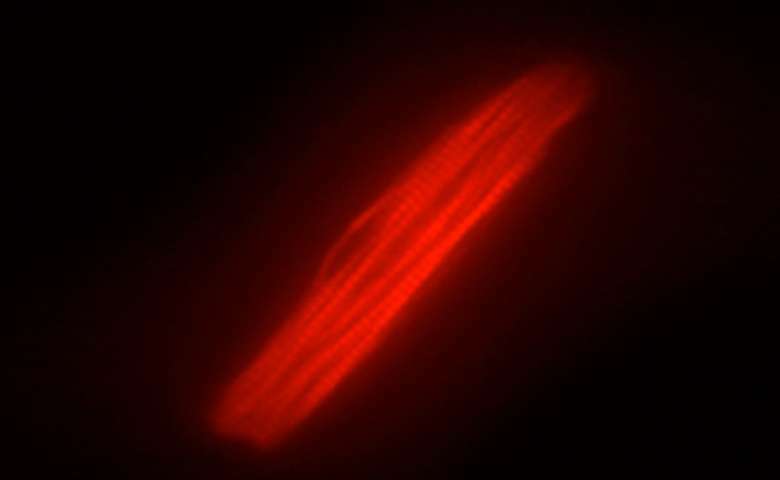 Growing better heart muscle in the lab. While researchers have been able to grow beating heart cells from stem cells in a dish for many years, those beating blobs of cells have not looked or acted much like the long strong muscle fibers found in a normal heart. A team at Stanford, with collaborators at the Gladstone Institutes have spent much of the past five years looking for ways to make lab-grown heart muscle more like the real thing. Heart muscle matured from stem cells functions better when grown in long, thin shapes. They published a couple of solutions in the Proceedings of the National Academy of Sciences this week. One of the keys was to make the stem cells feel more like they are in their natural environment, which is full of physical tension. When they grew the stem cells on substrates that provided that type of tension they got stronger heart muscle better able to beat in a synchronized rhythm. They also found that stem cells grown in long, narrow chambers produced heart muscle closer in appearance and function to the narrow muscle fibers found in normal hearts. The press release, written by our former colleague Amy Adams who now works for the University, was picked up by Medical Express. First patient in trial for blindness. Doctors at the Moorfields Eye Hospital in London have used specialized eye cells derived from embryonic stem cells and grown on a synthetic scaffold to try to reverse blindness caused by age-related macular degeneration(AMD). Prior clinical trials have injected similar cells but without the supporting structure of the patch to hold them in place. Also, prior trials have aimed to halt the progressive loss of vision in the dry form of macular degeneration. This trial is trying to reverse damage already done by the wet form of AMD. Each of the groups use embryonic stem cells and first mature the cells into a type of cell found in the back of the eye’s retina, retinal pigmented epithelium (RPE) cells. CIRM funds a team at the University of Southern California and the University of California, Santa Barbara that has collaborated with the London team and plans to use a similar patch system on a trial set to begin in the next few weeks. The London news got broad pick up in the media, including this BBC Video. Cross-talk in the brain linked to success. The National Institutes of Health issued a press release this week describing two early results of its major Brain Initiative. One team from the University of California, San Francisco, provided an explanation about why primate brains are so much bigger than other mammals, and a team from Oxford and Washington University in St. Louis mapped cross talk between different parts of the brain to various personality traits. The second group collected data on 280 measures such as IQ, language performance, rule-breaking behavior and anger that they mined from the initiative’s Connectome Project. Their analysis of 461 people found a strong correlation to sections of the brain talking to each other when in a resting state and positive personality and demographic traits. Those included high performance on memory tests, life satisfaction, years of education and income. The UCSF team showed that brain stem cells during early development produce as much as 1,000-fold more neurons in primates than in lower mammals. More important, they isolated a reason for this strong performance. As the brain gets bigger the stem cells don’t have to continually migrate greater distance from their homes, called the stem cell niche. Instead they seem to pack their bags and take the niche with them. “It is great to see data from large investments like the Human Connectome Project and the BRAIN Initiative result in such interesting science so quickly,” said Greg Farber of the National Institute of Mental Health in the release. The interplay of bugs and genes in our gut. The consumer press spends a considerable amount of time talking about the bacteria in our digestive tract, and now a team a Baylor College of Medicine in Houston has produced some data that suggests these microbial cohabitants of our bodies, called the microbiome, become important early in our development. In research published in the journal Genome Biology and in a press release picked up by Medical Express, the researchers showed that the microbiome in mice during the period they are nursing helps determine which genes are turned on or turned off, and those settings, called epigenetics, follow the mice through their adult life. Specifically, they found that the gut microbiome impacted the function of gut stem cells that we rely on to replace the lining of our digestive system approximately every four days. “This promises some exciting opportunities to understand how we might be able to tailor one’s microbiome exposure during infancy to maximize health and reduce gastrointestinal disease throughout life,” said one member of the team, Robert Waterland. Re: *First patient in trial for blindness* – I know that Ocata and Cha Biotech aren’t part of CIRM, but it might have added to your story to note that “they” are the others in clinical trials with RPE from hESCs, and combined they have treated 44 or 45 patients for both dry AMD and SMD – with no problems and, as reported in The Lancet, Ocata’s initial trial results on 18 patients, showed they stopped the progression of the disease in 17 and improved vision in 10 – with similar results reported by Cha in another peer-reviewed article. After reading the online article about Advanced Cell Technology’s RPE-derived from hESCs outstanding clinical results in The Lancet, I concluded that the implanted RPE cells were safe and efficacious, they stop the progression of dry AMD and SMD in 17 of 18 patients, and improved the vision of 10 of 18.